KUALA LUMPUR: A landmark Malaysian court ruling that upheld an independent news portal’s right to publish a newspaper has placed a spotlight on Prime Minister Najib Tun Razak’s pledge to loosen controls on the press. The Kuala Lumpur High Court on Oct 1 ruled in favour of Malaysiakini.com’s challenge against a refusal to issue a publishing licence to the site, which is known for content often highly critical of the government. Najib, who must call elections by mid-2013, has positioned himself as a reformer in a bid to recapture the support of voters who in 2008 handed his ruling Barisan Nasional coalition its worst polls showing ever. In April, he lifted a rule that forced publications to renew their printing permits annually — which gave the government leverage to ensure compliant coverage — but the home ministry still has the power to deny or revoke licences. For this, and other reasons, Malaysia’s opposition has dismissed the reform pledges as window-dressing for the election, and the court ruling could now put pressure on Najib to prove them wrong. The ruling has “opened the floodgates” for newspaper licence applications, said National Union of Journalists general secretary V Anbalagan, adding that trying to control the media was “futile” in the Internet age. “If they are refused permits, they can go to court and create a public issue over freedom of speech. The old business model won’t work for the ruling party anymore,” he told AFP. Opening up the right to newspaper publishing is likely to have major political implications in the multi-ethnic country, Southeast Asia’s third-largest economy. The ruling coalition — dominated by Najib’s Muslim, ethnic Malay party — has wielded press control as a major weapon to help remain in power since 1957, forcing the opposition to turn to the Internet to get its message out. The Barisan Nasional coalition had a virtual monopoly of the press until Internet penetration surged in the past decade. Malaysiakini, launched in 1999, and newer portals which sprang up in recent years, have garnered a following with content including racial injustice and official corruption — issues largely ignored by the government-controlled media. Such sites have remained relatively free — despite occasional raids and bans — due to an official pledge not to censor the Internet, made in the mid-90s to attract foreign investment. 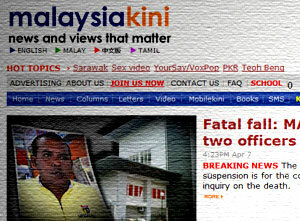 Malaysiakini co-founder and chief executive Premesh Chandran said the site now has 400,000 daily readers who generate 1.2 million page views each day. However, Malaysiakini wants to put out a newspaper to expand its audience and filed a legal challenge in 2010 after the government rejected the bid. The home ministry can now either approve the application or appeal the ruling. Home Minister Hishammuddin Hussein said his ministry was deciding whether to appeal. “We will seek an urgent consideration of our application (but) I got a feeling the home minister will drag his decision,” Chandran said, citing the coming elections. Malaysiakini has come under attack from Barisan Nasional leaders and pro-government media who call it an opposition mouthpiece being funded by foreign interests that want to destabilise the multi-ethnic country. Chandran said a licence is unlikely to come through before what are expected to be tough elections between the ruling coalition and resurgent opposition. But observers said granting the permit would allow Najib to shore up his reformist credentials. Masjaliza Hamzah, executive director of the Centre for Independent Journalism, a media watchdog, told AFP there would be little short-term downside for the government as “there are very few players who can afford to publish a newspaper”. “But Najib could win some brownie points if he issues the permit,” she said.